Another one of my long-time email inbox residents, Tabbles is an application that took me few attempts to approach. File management is a topic widely beaten and I don’t actually know (or really believe in) an app that pulls off something novel in usable way. On other hand there are file management sub-tasks that some apps are better at than others. Tabbles describes itself as document management and file tagging software. Tabble is file manager that primarily relies on its own construct – virtual folders that double as containers and tags. Any file can be placed/tagged in any number of containers. Containers can be grouped to highlight files that belong to all of them only. There are some functional container like file type to help with filtering. Basically it gives you an additional way to slice files, without regard of file system and files organization on disk. Other than few basic concepts app places little restrictions on user and so is very flexible. Structure becomes what you make of it. The idea of tagging files is nothing new, but Tabbles manages to treat it with polish and usability that actually equals decent experience. App requires cutting edge .NET Framework 4 (I must admit I didn’t even know it reached release, not even talking about seeing it in the wild). Performance is (subjectively) sluggish with occasional crash on top. “Portable” version refuses to work properly from local hard drive. Free version only allows to tag up to one thousand files. I quite like the concept and thought that went into this app. It is a pleasure to launch and poke. But few minutes in there and I am itching to switch out to Total Commander and do some real file managing. It boils down to your needs – if you have large amount of files that are better organized with tags rather than folders. Not many people I know do. 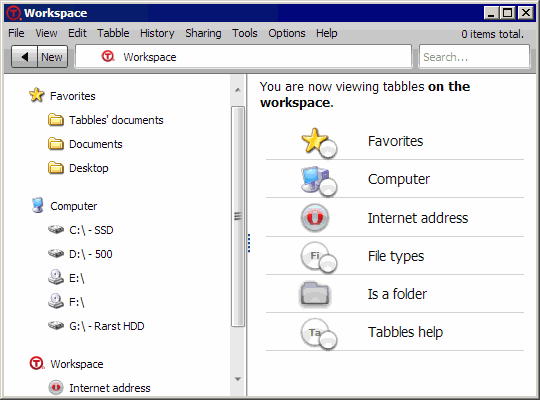 One comment only: we don’t think of Tabbles as a File Manager, but as a File Organizer or Document Management System. Moving/renaming files is not at all the main goal. We target people who produce data and use the same files in different situation/projects/times. Well, managing and organizing aren’t exactly far apart. :) I see that there is a strong potential for some tasks, but I don’t see it replacing conventional file manager.